Grilling is a great way to enjoy your BBQ food, but for the purists, only smoked meat will make the grade. If you’ve wanted to be able to make your own smoked and cured meats at home, then a smoker could be something that you’ve considered purchasing. With a purpose-built smoker you can follow the low and slow cooking philosophy, preparing your meat cuts over hours (or even a whole day) to get the most authentic smoked flavors. While a combo grill smoker can work for hot smoking methods, you will need an offset smoker or an electronic smoker if you want to get the best results at medium and low temperatures. We’ve put together a list of the very best smokers under $300, providing you with some great choices when it’s time to buy a standalone appliance. Cured and smoked meat is a favorite of BBQ enthusiasts, and you can even smoke food in traditional European style. There are a number of advantages to smoking your own meat at home, which we will cover before we get into our product suggestions. Smoking will kill bacteria on food and eliminate the growth of new bacteria. This is particularly important if you are smoking poultry that won’t be consumed immediately. It allows you to cure your own meat for preservation, including home-made sausages, jerky, or even bacon. Has the ability to make food more tender, allowing you to use cheaper cuts of meat that wouldn’t be suitable for the grill. Smoking meat is inexpensive and will often be cheaper than purchasing large cuts of smoked meat from your butcher or grocery store. Smoking is a time intensive process and that means that companies need to sell smoked products at a premium. Do it yourself and you could save hundreds over a year, depending on how often you enjoy smoked meat. When you smoke your meat you will know exactly what’s going into the process. You don’t need to worry about chemical preservatives and stabilizers when you do it at home. You can gain all of these advantages when you choose from the best smokers under $300. This would be the ideal smoker if you are looking for something that you could use when camping or hunting. When you want something that is relatively small and lightweight, then this Masterbuilt Portable Electric Smoker is a great choice. It comes in at the lower end of the price range for the best smokers under $300. This would be the ideal smoker if you are looking for something that you could use when camping or hunting, or at a holiday home or the family cabin. It can be easily transported and comes with folding legs so that it can be set up almost anywhere. Of course, you could also use this as your main smoker at home, and it would be a good option if you want the ability to smoke your food but don’t need a large offset smoker. Beinga n electric smoker so there’s no real learning curve and no major ongoing maintenance requirements while you are smoking your meats. 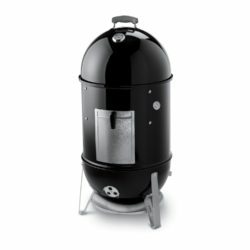 This smoker can be set to high, medium, or low, depending on what your needs are. The high setting can allow you to smoke food quickly that you want to consume right away, whereas the lower temperatures can be used for longer smoking sessions when you want the best possible flavor for preserved cuts of meat. The wood chip tray and water pan can be easily removed in case you need to add more wood chips during a smoking session. 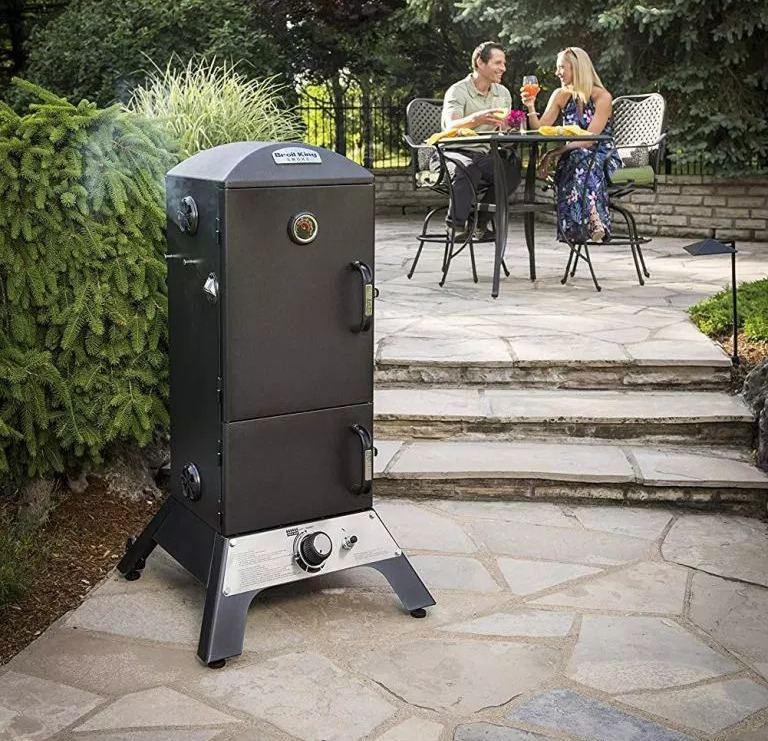 Although there is no maximum weight limit specified for this smoker, you will need to keep in mind that its small size means that it is meant for smaller cuts of meat and fish. Chicken, duck, and small turkeys can fit in this smoker, although you will need to remove some of the racks to fit the whole bird in the smoker. Generally, you will want to keep the total weight of your ingredients below 20 lbs., which won’t be a problem for most people who are looking for a smoker of this size. Customer feedback for this model has been extremely positive, with an average online review score of 4.4 out of 5 Stars. More than 80% of all reviews are 4 and 5 Star reviews. Stepping up from the small and portable Masterbuilt smoker, you could choose the Masterbuilt 20071117 30” Digital Electric Smoker. The mentioned smoker has more capacity, an electronic temperature control system, and would be suitable for home smoking for enthusiasts who want to cook larger cuts or meat, or who need to cook more food items in the same smoking session. As a cooking appliance this model is attractive and doesn’t look vastly different from a small refrigerator. It would look perfect in an outdoor covered barbecue area, and could be installed in a permanent outdoor kitchen if you have the right space and ventilation. Although more expensive that the first model that we looked at, this grill still fits well into the best smokers under $300 category. It is especially affordable when purchased below the list price, and you will often find that this unit is discounted due to its popularity. There are some ease of use additions to this unit that make it simpler than a portable unit. 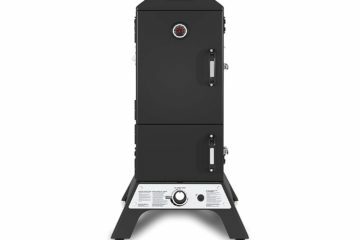 Most importantly, it has a side wood chip loading system that allows you to add your smoker fuel without opening the main door. This helps to keep temperatures within the ideal range, and can allow for faster and more consistent smoking. It also helps to keep the energy usage low. 2 whole regular sized turkeys. 8 full racks of ribs. Up to 64 sausages (depending on size). 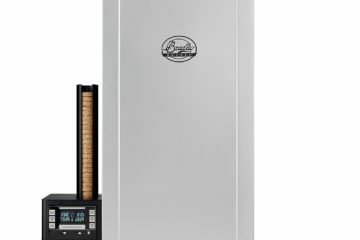 Your actual capacities can vary depending on the size of your cuts, but the point is that this smoker can handle a large amount of food, which makes it great for preserving, or for smoking meat at a gathering of family or friends. The digital control panel makes this a set and forget smoker where you don’t have to constantly manage a solid fuel source. 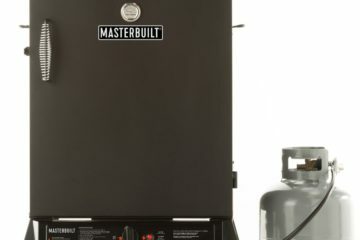 This is easily one of the best smokers under $300, and is easily recommended when you need something slightly larger and more capable than the most basic smokers. The advantages of having a glass window are numerous. Stepping up yet again, we have another Masterbuilt smoker that incorporates some nice features for anyone willing to pay for them. It still falls into the best smokers under $300 category, so if you are comfortable throughout the price range then you could find that this one has the features that will work for you. The most noticeable difference in this model is the overall design. It combines a grey and black color layout with a full-sized glass viewing window that will allow you to monitor your food as it is being cooked. It is also slightly larger than the previous model, offering 975 square inches of total cooking area. The advantages of having a glass window are numerous. This allows you to monitor when you need new wood chips or more smoke, and it also allows you to watch food for doneness as it cooks. While the true test will be the internal temperature of the meat, it’s still beneficial to quickly glance at the food to get an indication of how far along it is in the cooking process. It can also be fun to see how the food slowly changes in color and size as it is treated to high, medium, or low and slow smoker cooking. The Masterbuilt 20075315 continues the digital theme with a fully electronic temperature control system. It also includes a remote control so that you can change settings from a distance. This is great if you are busy entertaining and maybe even grilling while your smoker is working in the background. There’s an internal light so you’ll still get a great view of your food in low light conditions. The remote control doesn’t just allow you to change the setting on your smoker, but it also provides real time feedback, including the temperature inside of the smoker. 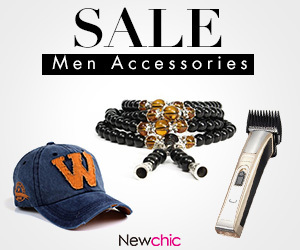 It’s is a great innovation, and you will love the convenience that is provided by this model. 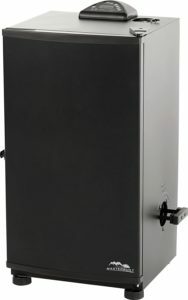 This is one of the most popular electric smokers currently on the market, and there have been almost 4,500 reviews submitted for this model online. Average customer rating is 4.2 out of 5 Stars, indicating a well-loved product that is worthy of your investment. This model from Weber is high quality and allows for 481 square inches of total cooking area. A charcoal smoker is also an option when you want something simple and traditional. Although not as convenient as an electric smoker, a charcoal smoker will provide a richer smoke flavor, which may be preferred. This Smokey Mountain Cooker model from Weber is high quality and allows for 481 square inches of total cooking area. It has a built in thermometer gauge that will allow you to closely control the temperature as your meat is smoked. There are two cooking grates inside, allowing you to stack your food to make the most of the space that is available in the cylinder. Charcoal smoking is recommended if you need to smoke away from the main power grid, so this could be perfect for a cabin or holiday home. The small size also makes it relatively portable, so it could be taken on camping/hunting trips, or stored in an RV. This smoker can provide excellent results, but be warned that there is a bigger learning curve when you cook with charcoal. If you’re ready to take on the challenge, then you will find this to be an excellent option in the best smokers under $300 category. The total smoking area for this grill is impressive, with 784 square inches of total area. 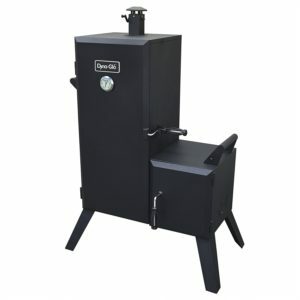 Our final recommendation in the best smokers under $300 category is the Dyna-Glo DGO1176BDC-D Charcoal Offset Smoker. 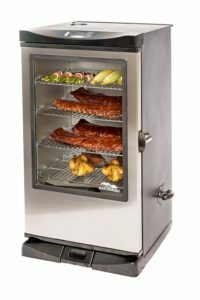 This is a large smoker that provides plenty of cooking space, and it has an offset design that allows for continuous maintenance of smoke/temperature without needing to open the main door. The total smoking area for this grill is impressive, with 784 square inches of total area. This is divided between six cooking racks which you can use in any combination necessary.A serious smoker for enthusiasts but its simple design means that it comes in at a great price. The body is constructed from steel and it is powder coated for a classic black finish. The powder coating will protect the steel and ensure that this smoker lasts for many years to come. If you want to store this smoker outside in a semi-covered area, you can purchase a Dyna-Glo premium cover that is specifically fitted for the offset design. This smoker is unique in the list because it is the only one to feature a separate wood chip chamber. This means that the food inside will receive indirect heat, making it perfect for low and slow cooking. You can still turn up the heat when you need to by adjusting the smokestack on top of the main smoking chamber. While not the best smoker for beginners, this is great for experienced smokers who need something with a large capacity for cooking and preserving. 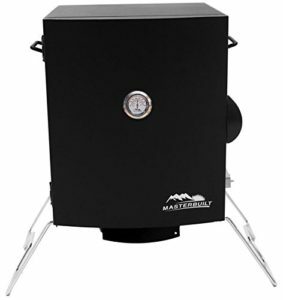 If you are a beginner and want to know what makes charcoal smoking so special, then it is recommended that you co for a smaller model like the Weber Smokey Mountain Cooker. Of course, the choice is ultimately up to you, and any of these best smokers under $300 can do the job with highly efficient heat. 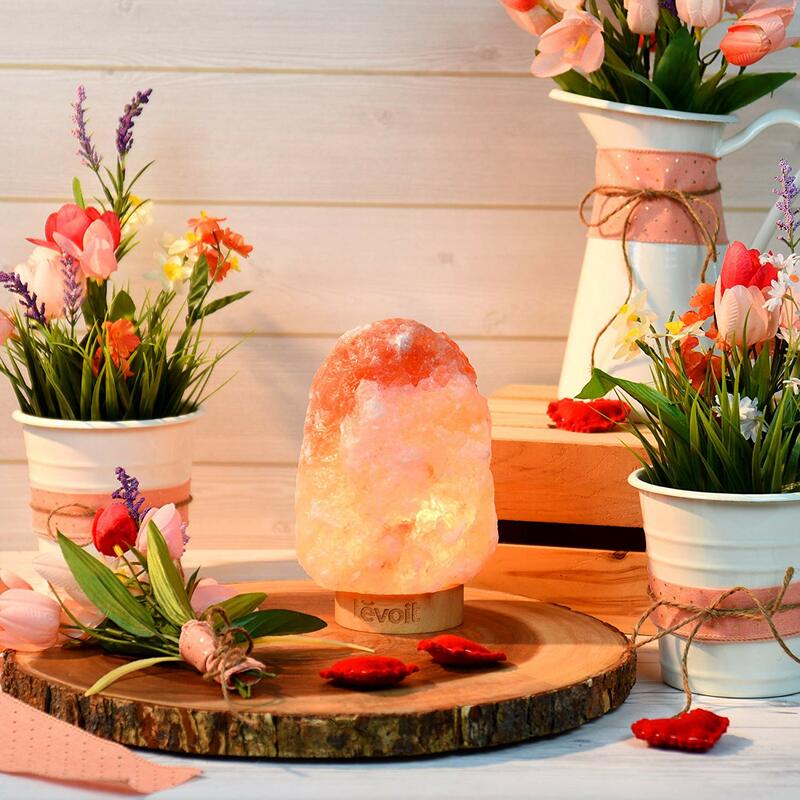 Opt for electric if you want maximum control and ease of use, or choose one of the charcoal models when you want something more traditional that doesn’t rely on an electrical power source.